NASA astronaut Tim Kopra and European Space Agency astronaut Tim Peake will work outside the International Space Station today (Jan. 14). Here, Peake is undergoing his final suit check Jan. 11. 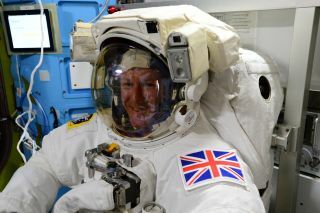 British astronaut Tim Peake walked in space outside the International Space Station on Jan. 15, 2016. A new online test will help the European Space Agency develop its astronaut selection process. ESA astronaut Tim Peake took this image while passing over South Africafrom the International Space Station on April 3, 2016. An image of moonset from the International Space Station taken by British astronaut Tim Peake on March 28, 2015, sets the lunar body against a deep blue backdrop.